This simple Salt and Vinegar Roasted Cauliflower is bursting with flavor and perfect as a snack or side dish! Earlier this month I went to dinner with some of my girlfriends at a restaurant specializing in shared “small plates,” and one of the items we ordered was salt and vinegar roasted cauliflower. Now, I generally feel kinda “meh” about cauliflower (unless it’s Buffalo Cauliflower Wings), but I love salt & vinegar chips, so I was interested to see how the flavors translated. This cauliflower was anything but meh! I couldn’t wait to recreate the dish at home, especially since cauliflower is my husband’s favorite vegetable. I’m happy to say that Salt and Vinegar Roasted Cauliflower tastes just as amazing in my kitchen as it does at a restaurant, and it’s so easy to make yourself! The bold flavor would make a great side dish for a meaty main like grilled chicken or fish, or work beautifully as part of a “snacky” meal with fruit, crackers and a cheese plate. Plus, a serving of this salty, tangy goodness is just 103 calories or 2 WW Freestyle SmartPoints! Looking for more delicious lightened up side dishes? Check out my Garlic Roasted Green Beans with Almonds, Easy Garlic Knots, Roasted Fingerling Potatoes, Easy Salsa Rice, Broccoli Salad, Roasted Delicata Squash, Butternut Squash Quinoa Salad, Avocado BLT Pasta Salad, Strawberry Quinoa Salad, Cheddar Broccoli Orzo, Roasted Smashed Garlic Potatoes, Garlic Thyme Roasted Carrots, Cheesy Broccoli Bake, Spinach and Parmesan Orzo, Parmesan Roasted Sweet Potatoes, Loaded Cauliflower Bake, Zucchini Casserole, Cheesy Potluck Potatoes and more in the side dish section of my recipe index! Pre-heat the oven to 425 degrees. Line a baking sheet with parchment paper or aluminum foil and set aside. 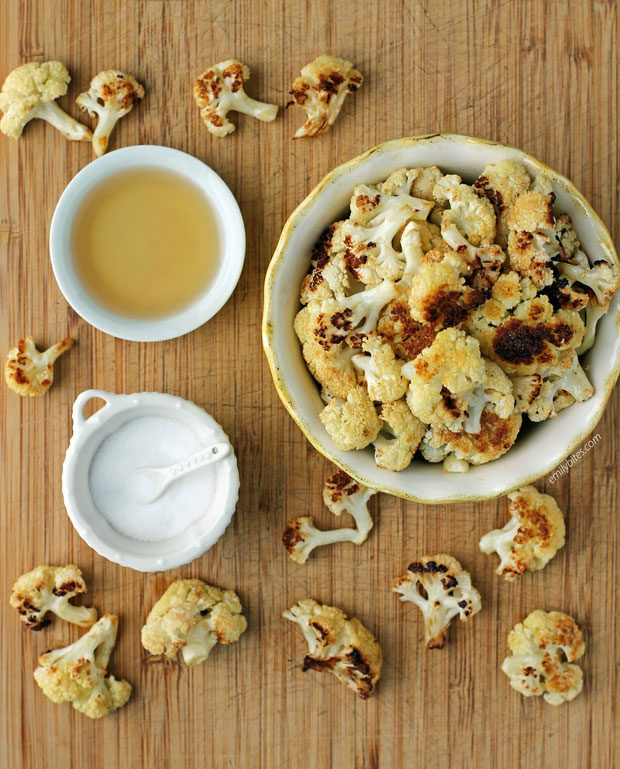 Place the cauliflower florets in a large mixing bowl and drizzle with the olive oil. Toss to coat. Drizzle with the vinegar and toss to coat again. Sprinkle with the salt and toss a third time to coat. Transfer the coated florets to the prepared baking sheet, arranging them in a single layer with a bit of room for each piece to “breathe” to allow them to get crispy (you may need to use more than one baking sheet depending on the size of the sheet). Bake for 30-35 minutes until parts of the florets are golden and a bit crispy. Is desired, you may add a bit more salt or vinegar to taste before serving. I enjoy your blog and recipes. I can’t wait to try your salt and vinegar cauliflower! How well do these refrigerate? Do you think an air fryer would work? I just got one so I’m still in the “let’s see what happens” stage. What a GREAT idea! I’ll be making this tonight! Thanks so much!! Keep ’em coming! I love anything salt and vinegar! Yum! 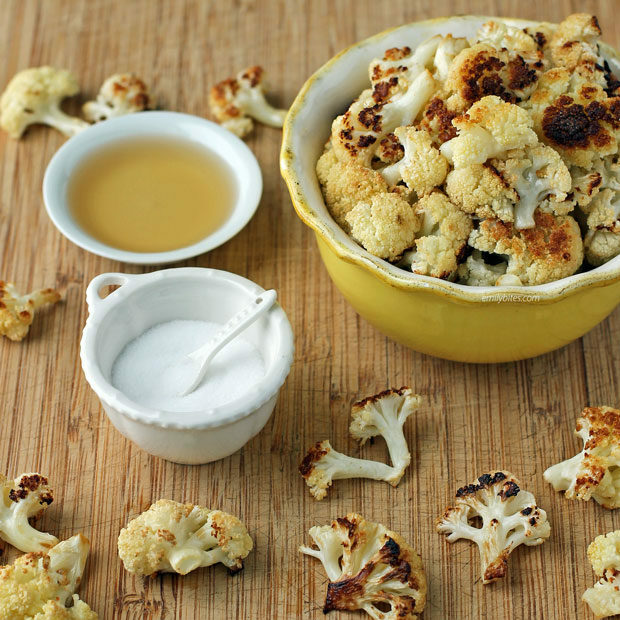 Seriously the best cauliflower recipe I have ever eaten. I wish I had another head right now! This turned out awesome. Thank you!